Yummy California Pinots! Just in time for Thanksy. — Wine is my favorite snack. Ginger Jen, happily making her notes! For this gathering, and as a follow up to the tasting we did before (see that post here) we wanted to change it up. This time we told our guests that they were tasting Pinot Noir from California, but that is all. Bottles were covered (even I did not recall what we had and I helped pick them out) and guests were seated with tasting sheets. 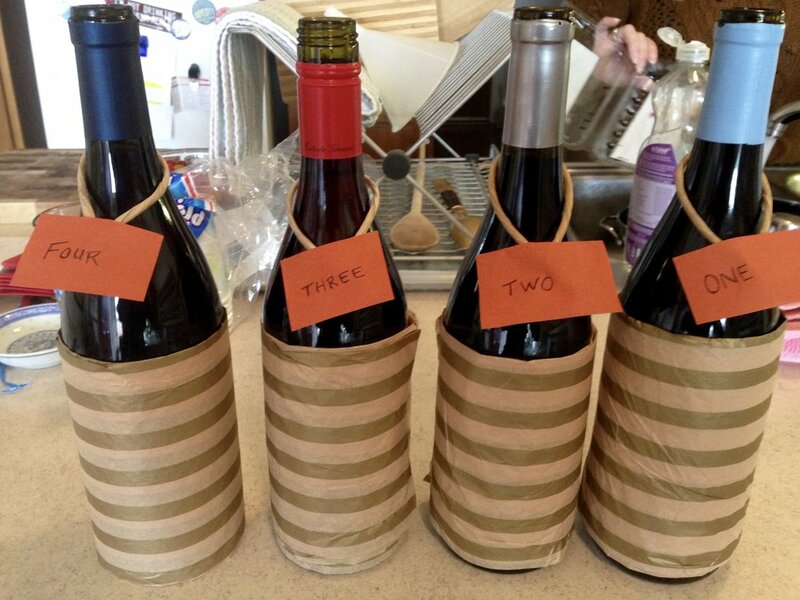 We poured the wines in order, 1-4, as they were labeled and let the tasting commence. Why do it this way? The goal was to allow everyone to truly taste the wine, be with it, savor it. Sometimes the influence of price point, region, winery will shape our opinions without us even realizing it. So we tried it this way. We also withheld the edibles until post-tasting and notes were made. Is that because we are cruel? No. The flavors of foods can sometimes compete with or interfere with our ability to truly taste the wine. We conducted the tasting, everyone made notes, and then we revealed the wines and let the good times roll! Happy Tasters. Photo by Gabriel Manzo. Before doing that, we were illuminated on the four different regions that each wine was from, and given an opportunity to guess which wine was from each. The areas were: Sonoma Coast, Santa Cruz Mountains, Monterey County and Santa Barbara County. There are some noteworthy Pinots from each, but some more closely associated with Pinot Noir than others. We all enjoyed ALL of the wines, but we had our preference. Might it surprise you that the group pick for the overall favorite California Pinot Noir was from The Santa Cruz Mountains?! It was a revelation for me. In a happy way. This was a very fun way to taste wine with friends. Whatever you drink for the holiday, I hope it is tasty! Alfaro Family Vineyards & Winery 2014 "A" Estate Grown Pinot Noir, Santa Cruz Mountains. Grapes for this wine were sourced from four different estate vineyards. Aged for 10 months sur lie (on the lees) in French Oak. Only 2300 cases produced. ABV: 13.5% Retails for $25- Tasting notes: Bright cherry and raspberry notes on the nose. Bing cherry, vanilla and spice on the palate with a welcome acidity. Lovely! Chalk Hill 2014 Pinot Noir Sonoma Coast. One of the more entry level wines for Chalk Hill, this Pinot Noir retails at about $25-. This is a very fruit forward style of Pinot with luscious berry on the nose and the palate. Delicious now or age a bit. Should be easy to find. Talbott Vineyards 2014 Kali Hart Estate Grown Pinot Noir, Monterey County. I love all of their wine. All Talbott does is Pinot Noir and Chardonnay, and they do it very well. ABV: 14.6%, a bit hotter than the rest, showing up as spice. The Kali Hart retails for $21-$26- Tasting Notes: Vanilla Cherry Cola on the nose with an herbal waft at the end. On the palate a minerality appears, crusting the dried berry cinnamon flavors. The finish is succulent with more fruit and the smokiness of the oak. Tasty! Au Bon Climat 2015 Pinot Noir Santa Barbara County. The wines from Au Bon Climat are referred to in the industry as "ABC". They make a lot of Pinot Noir, sourcing from different vineyards. The 2015 is a blend from 5 different vineyards: Bien Nacido, Rancho Vinedo and Le Bon Climat, all of which are in the Santa Maria Valley, and 2 vineyards in the Los Alamos Valley which are Los Alamos Vineyard and Kick-On Vineyard. Aged in French Oak for 10 months. ABV: 13.5%. Retails for $24- Reliable and consistent at this price-point. This wine offers a parfait of blackberries and strawberries on the nose. It evolves to reveal notes of cloves and drinks juicy with a ribbon of puckered tannins. Get some! I am thankful for wine. And Gabe. And wine with Gabe. Confirm your subscription in your e-mail and you will be all set.